Screen adaptation of Stephen King's best-seller. 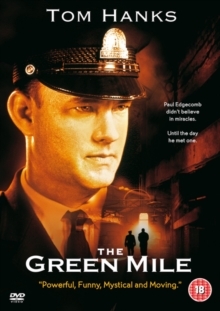 In 1935 Louisiana prison guard Paul Edgecomb (Tom Hanks) meets convict John Coffey (Michael Clarke Duncan) and it is an experience which will change his life forever. Coffey, an eight foot giant, is on Death Row convicted of the murder of two children - and he is afraid to sleep in his cell without a night-light. Coffey also has a special gift, one which he uses to prove to the guards that he has been wrongfully convicted.